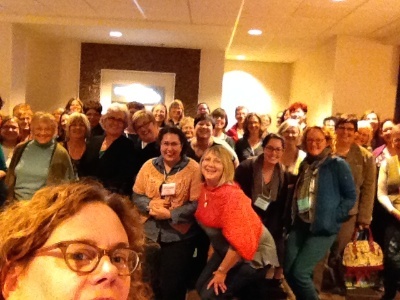 A few words about concentra… hey look, a bird! Here’s one of the things about knitting. There’s lots of different kinds. I don’t just mean there’s colourwork, or lace, or entrelac, I mean that there’s different sorts of it that you can do to fill different holes in your time. 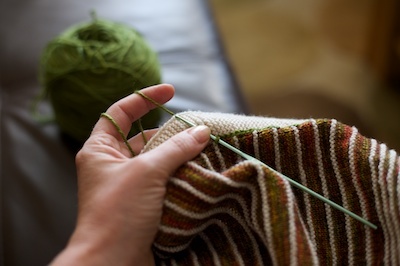 You can have fancy knitting that you do when you’re pretty bored, and need a lot of entertaining, or you can have reasonably straightforward knitting that you pick up and put down while you work on other things, or watch a movie. Then there’s the dead simple stuff that you work on while you’re on the phone, or in conversation, or walking, or in a meeting… the stuff that you don’t even need to look at. There’s all those kinds and more, and I think it’s remarkable that knitting can be whatever kind you need it to be, if you just choose wisely. Now let’s talk about Fox Paws. Fox Paws is a pretty wild pattern. There’s some really crazy increases, and some truly mad decreases, and those increases offset the decreases and …. you should think of it like it’s Feather and Fan on smack. For a little while (just like with Feather and Fan) before you have a little bit of knitting so that you can tell if things are lining up, you just can’t tell if things are lining up, and not only that, it took me several rows to see how things were meant to line up at all. The first time through, I had no idea how it was going to go together. Fifth times the charm though, and as long as I don’t deviate from the rules, everything is okay. What are the rules you ask? Well, I’m not sure I have them all figured out yet. I can tell when I’ve broken one because I always have to rip back at least two rows, and I curse like a sailor. That’s the minimum price that Fox Paws charges if you let your attention wander, because see, that’s the thing. Fox Paws isn’t hard. Well, fine. It’s a little hard, but I like a challenge and so do some of you and this is perfect for if you were hoping to grow a few more neural pathways and try to stave off dementia. I’m pretty sure I can feel it doing that, so yes, it’s hard, but a good hard, not an impossible hard. It’s just… tricky. You have to pay attention. You have to concentrate, and if you don’t, then all of a sudden things come of the rails, your little paws have something really, really wrong with them, and then the numbers are all funky and you’re tinking back a million stitches trying to find the last place everything was okay. Do you know how long it takes to tink back some of those freaky decreases? It’s not insignificant. Let’s say that. I’ve learned that I can’t knit Fox Paws on a plane, if I think I’m watching the movie or talking to the knitter next to me. When I flew home on Monday, I don’t think I made it through four rows. I wasn’t concentrating. 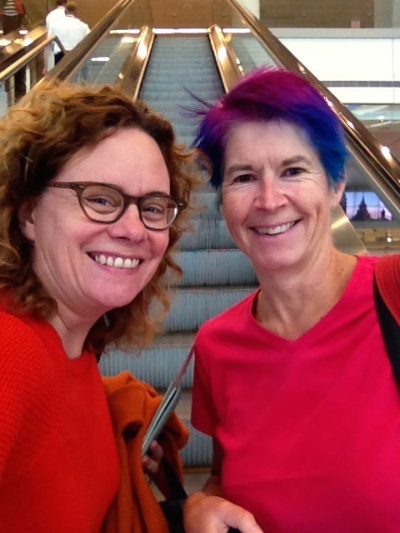 It was the one and only time a knitter/stranger sat beside me on a plane, and I must have looked like an expletive muttering lunatic who couldn’t knit my way out of a paper bag. I’ve learned that I’m not knitting Fox Paws in the car. There’s too much going on. You might look at a bird or something, and then the whole thing is going to crap. Similarly, the subway is right out. 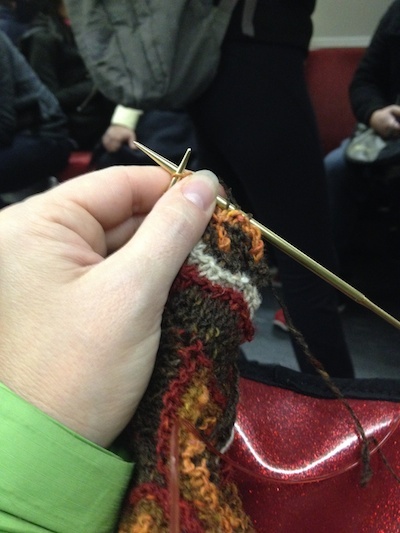 I glanced up for a second to see if it was my stop and my knitting blew up. Luckily I was only a half row in when I realized that it wasn’t compatible. You can’t do anything crazy, like take it to dinner. FOX PAWS HATES GOING TO DINNER. You absolutely probably want to stay away from this. 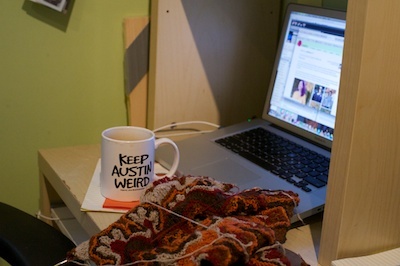 Fox Paws also can’t be my “next to the desk” knitting. Usually I’ve got something there to knit while I read, but this obviously is not the right thing. 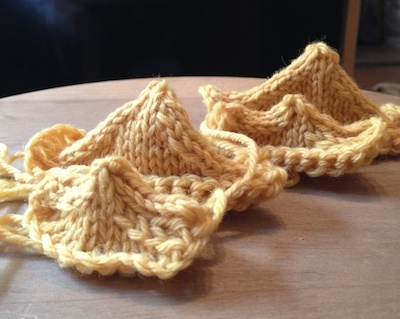 You have to look at your knitting, if you’re knitting Fox Paws. I tried it in the kitchen. I always take my knitting in there too. I think I know now what Fox Paws wants. It wants to be alone with me. With just a cup of tea, and no distractions, and nothing that could interrupt our time together. It wants me to say “SSSSHHHHHH!!!!!! !” to any member of my family that tries to screw me up by saying really inconsiderate things, like “Hi”. It doesn’t like the TV. It’s not sure about Audiobooks. It doesn’t care for the cat. I finished Acer just in time for Rhinebeck. Not totally in time for the whole thing, but in time for at least Sunday and that seems like it still counts. I was feeling pretty good about how the whole thing was going, when I realized the night before that I had no buttons for it. I went through the whole button stash and couldn’t find a single one that was perfect, and I needed five. 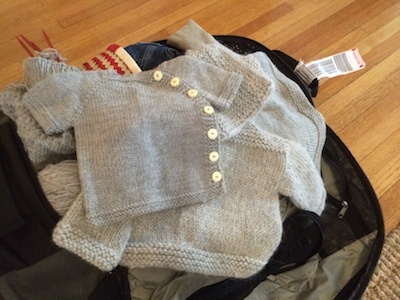 One quick trip to WEBS later, as we made our way from the Boston Airport to Rhinebeck, and the buttons were in hand. I pretty much took leave of my senses and forgot thread though, so when I went to sew them on on Saturday morning (after I set the sleeves in for the second time – the first time they went all Princess Diana puff sleeve on me) I was screwed. I went to the fair without it. I’d buy thread at the fair, I figured. Pro-tip. There is no thread at the fair, near as I could figure, I found some at the grocery store (I know!) on the way home that day. Buttons addressed, Acer made her inaugural run on Sunday, which was totally cold enough to make me wonder why the hell I thought a cabled sweater with lace was a good idea, but it’s not her fault that I was under-dressed. Other than the freezing cold part, it’s a good sweater, I think. 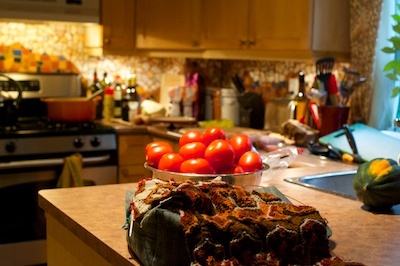 I’m still on the fence about the colour, but really – how many orange/rust/red/brown sweaters does one woman need? The best part about wearing it on Sunday? I met the designer, while I was wearing it, and I think it was fun for both of us. 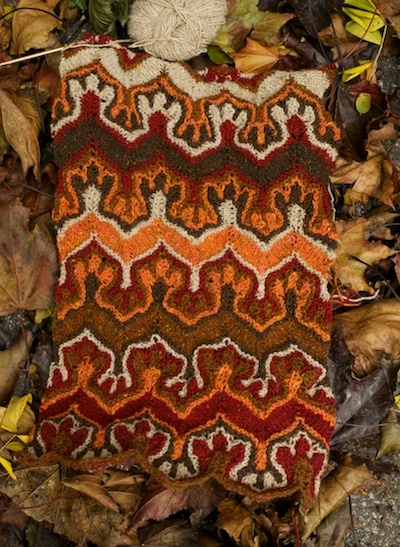 Acer, designed by Amy Christoffers. 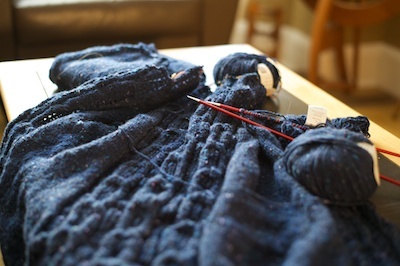 Yarn: Debbie Bliss Luxury Tweed Aran in Navy. Time to knit, about three weeks spread over four years. 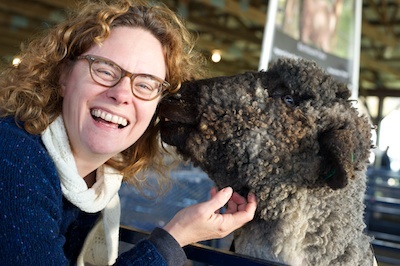 I’m back from Rhinebeck, and oh, it was lovely. 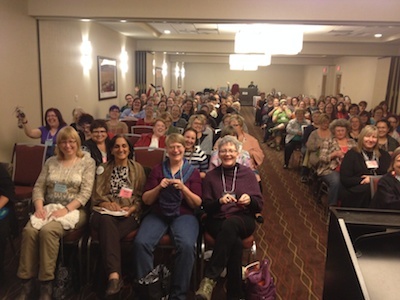 I share this time each year with the same group of great knitters, and it’s such a treat to be together for several days once a year. 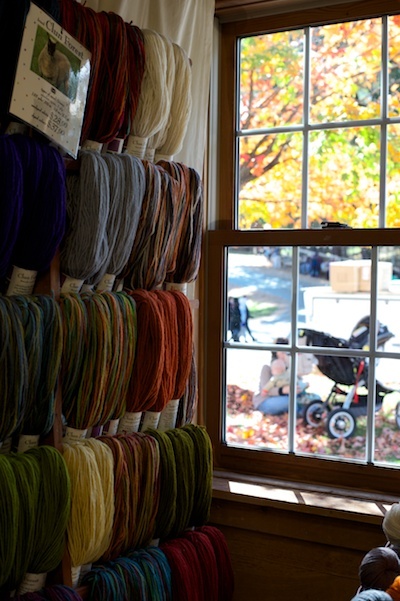 Rhinebeck feels like a knitters holiday to me. 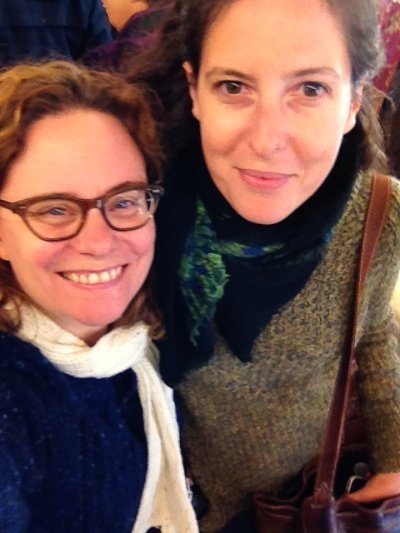 So many wonderful things, and sweaters and people and… it’s amazing. I had a lot of words to go with these pictures, but as you can imagine, following the events yesterday and today, most Canadians are glued to the TV right now. Rather than not post at all, I give you pictures. Words tomorrow. I’ll try and post from the airport on my way to a rather amazingly fabulous event in Edmonton. Four things that happened this morning. 1. I stayed up super late, but I got all the sweater pieces finished, and washed, and semi-blocked. By semi-blocked, I mean that I laid it out sort of orderly on the rack of the dryer, and then set it for a while, and went to bed. 2. I got up super early, so that I could hit the reset on the dryer if it was still too damp for sewing up. Even though this means that I got way too little sleep, it was a very good call. All pieces are now dry, and in my suitcase. I’ll sew them up when I land. After I buy buttons. Ok. I’m a little behind. I still think it’s totally possible though. 3. I drank coffee and carefully wound some yarn for the trip, then realized that I’d wound the yarn in the wrong direction (don’t laugh, this yarn totally has a direction) and decided to quickly re-wind it. I’ve known that my ball-winder was headed for the great big yarn shop in the sky for some time – I can always tell that I’ve worn through another one when they start making breast shaped yarn cones instead of pretty cakes, but this one confirmed it’s impending absolute uselessness by being nearly completely bloody useless this morning. It made a freaky shaped yarn thing, then flung it off the winder, tangling in the tension curl, and tumbling to the floor with the other half of the ball. (It there collected an unreasonable amount of cat hair, but that’s hardly the ball winders fault.) It did this as my cab arrived. I had 30 seconds to curse its vile name, put the tangled snarl into my suitcase for rescue tonight, and quickly grab something already wound. I guess I’m making socks. 4. I drank enough coffee (see #1 and 2) that I can sort of feel my hair growing. This year, I swore it would be different. This year, I swore that I would get a grip, and not do this to myself, and just opt out of the madness, because it’s totally optional. 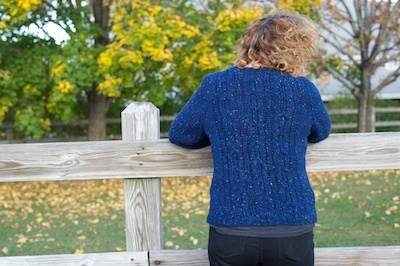 This year, when I finished Myrie’s sweater and found myself a week out from Rhinebeck, I had a moment of complete and total delusion in which I wondered if I could knit a Rhinebeck sweater in a week. (Actually, this year it was six days.) I sat there, and I thought about it, and I even went so far as to choose yarn and a sweater, and I calculated how much I would have to do each day, and I thought about what it was like last year, and this year, I looked at my time and energy, and my friends, I chose life. I still wanted a Rhinebeck sweater though, and I thought about something that @litknitgrit on said on Twitter, when I asked if it was too late to try for one. She said “The trick is to find one almost finished that needs sewing up and blocking. You know you have one”. I thought about that – and you know what? She was right – or sort of right. A little while ago (FINE. MAY 2011) my friend Andrea and i were having a little knitalong on a sweater, and I don’t know what happened, except that both of us wandered off, really close to the end. Since then that sweater has been plunked in a bag, just waiting for me to care about it again. 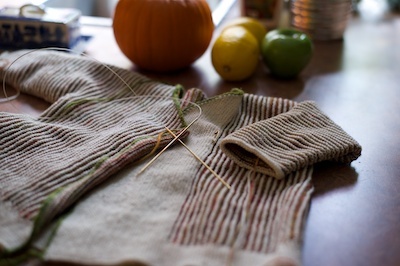 I had knit both sleeves, and the better part of the body. I was almost at the part where you divide the thing into two fronts and a back, and other than that, it just needed button bands, and buttons, and blocking, and sewing up. This – this seemed perfect. 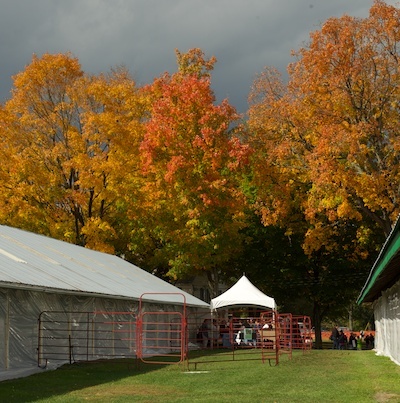 This year, I thought, as I pulled Acer out, and hunted up the pattern again – this year I would have a Rhinebeck sweater, and it would be easy, and I wouldn’t have to stay up all night, or put it in the oven, or sew it up in the car on the way to the fairgrounds. 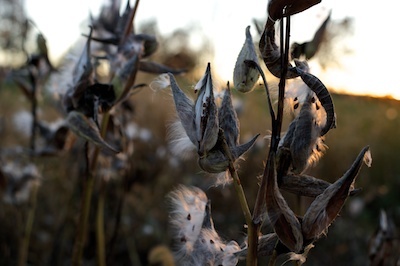 This year, I had it licked. This year, I got too cocky. This year, my friends, I was wrong again. Turns out that Acer needed more than I thought. (The tiny angry owls were probably a mistake too, time wise) I thought I was pretty much done the body – Wrong. It needed about 8 more centimetres, and I’ve somehow only got one front done (and it’s the wrong length. I have to rip it out and add more, and last night I finished the back, but that still leaves 1.5 fronts and the button bands and the neckband, and the blocking, which is really the biggest problem, because that’s the only thing I can’t make happen really fast. (I have a rack for the dryer. It might work, but that’s not really blocking. Still, it’s as good a day as any to cheat.) After that there’s sewing and buttons and …. 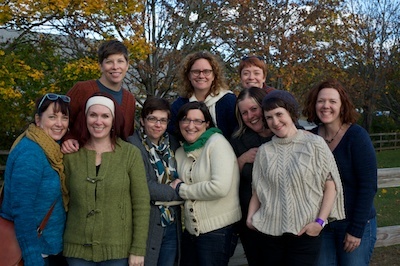 And I’m starting to think that there’s a thing with the Rhinebeck sweater. Maybe it has to be like this? Maybe it always ends in a mad dash to the finish, maybe that’s part of its charm? Who the hell knows, certainly not me, and I can’t talk about it now. I’ve got a flight in the morning, and in the name of all things woolly and pure – I will have this sweater. After I finished Myrie’s sweater, I decided to follow in the grand tradition of knitting the littlest cousins matching things. (It’s not actually a tradition. I just made that up.) it seemed a waste to not make the most of the 24 hours I had free before Thanksgiving/Myrie’s Birthday gathering to make her and Lou more knitted things. Last week, a promo copy of Gramma Nancy’s Animal Hats arrived here, and at first glance, I thought it was perfect. A lot of the time when things arrive here without me asking for them, they get passed along to a knitter who will really use and love them, but this book reflects a deep truth that dwells within me. One of the things I like best about little kids is that you can put whatever you want on them, and this book totally feeds that bizarre urge to dress a little baby up like a chicken. (Or a pig. Or a BEAVER. See? It’s totally normal.) On second look, I wasn’t sure the book was for me. The hats are all knitted out of Vanna’s Pride (a yarn that I’m not a huge fan of, I like natural fibres for the very young. Get them while they’re little, I say) and more than that, all the parts of the crazy cute hats were supported with styrofoam (no thank you) and put together with a hot glue gun. (Would that really work?) While it’s totally fine for you to like those things, I don’t like those things (also I dislike apple pie and mistrust most dogs) so I almost put the book aside, then got a grip on myself and realized that I could change the yarn, and stuff things with wool roving, and sew wherever she said “glue”. Once I had that idea sorted I was on my way to hat town, and there was no stopping me. One evening had the simple roll brim hats finished, and I thought once that was done, that would be the bulk of it finished. Wrong again, knitter. 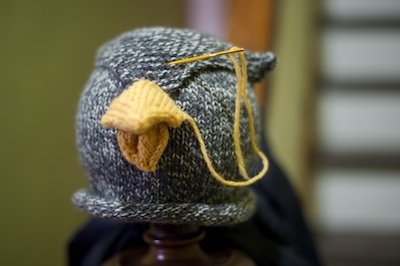 It took longer to knit all the little bits (beaks, ears, etc) than it did to knit the hats. I found it easier to get the beaks on if I put the hats over the newel post for the stairs, I used it like a huge darning egg. (Let us gloss over the part where Joe came home from work, and I had a baby hat over our stair-post, and was sewing an upper beak on while clutching a lower beak in my teeth. It wasn’t a super normal moment in our marriage.) The wee hats, when they were finished, were a thing of beauty. I love them. No, wait, that needs all caps. I LOVE THEM. LOOK AT THAT. 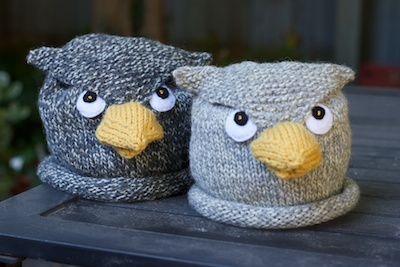 THEY ARE OWL HATS. 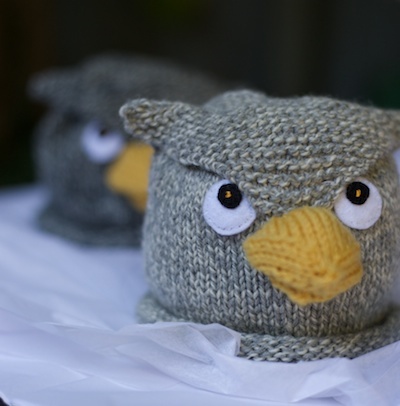 TINY LITTLE ANGRY OWL HATS. Best part? We can make the tiny people wear them, for they have no power. Ok. Maybe they have a little power. Myrie tried to eat the beak off hers, and then threw it on the ground. I believe she’ll feel differently when the snow flies. There’s nothing like super-cold weather to bring a kid round to the power of hats. She’ll get there, and even if she doesn’t? What a weekend. 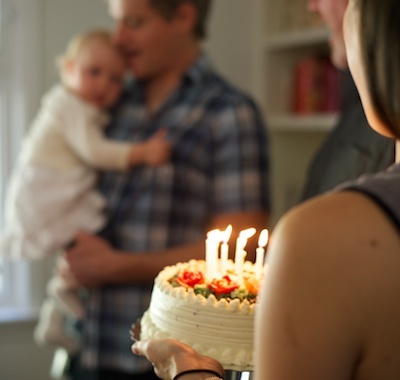 I charged through Thanksgiving, Myrie’s first birthday party, a quick sail, and tons of cooking and family and it was the very best kind of busy, although I feel now like having a little lie down. Still, you come here for the wool, so let me tell you about the sweater. Myrie, my little niece (I bet even though you don’t know her, you remember her blanket) celebrated her birthday this weekend. My relationship with Myrie is a different one than I have with my nephews. Both the boys (Hank and Lou) live close by, and we’ve been lucky to have a lot of them. Myrie lives farther away, and her mum and dad travel in different circles than we do, and their tiny family of three is perfectly, gorgeously tight. This means that while I’m absolutely thrilled that their lives are just the way that they like it, if I ran the world, that kid would be in my arms, my house and my time a lot more often than she is. Me being a knitter, I have only one way to express this. 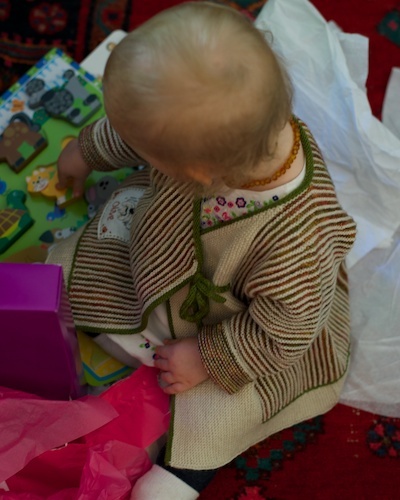 I can cover the child with wool like it was my arms, and try to make the things for her as special as I can, so that she knows I love her. (Please note that I am not completely delusional. 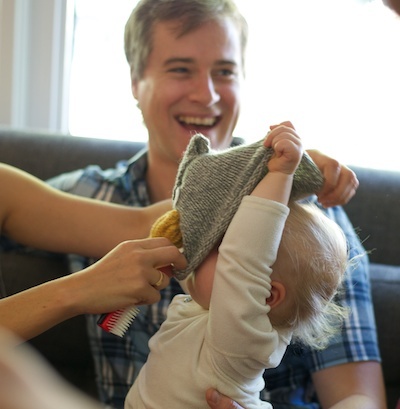 I know that a one-year old has no idea that someone really seriously busted a move on a sweater, and has no idea what vibe I’m transmitting. She’d rather chew on the ribbon I put on the box the sweater came in- at this age, all I’m doing is pleasing her parents, and making things that maybe Myrie will look at someday when she’s much bigger, or a mother herself.) You’d think not being as close to her as I’d like wouldn’t trigger special handknits, but oh, does it. 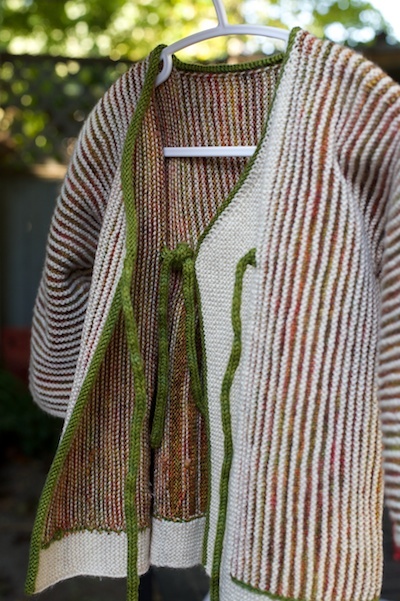 All the time I would spend in the park, on walks, reading books… that time can all go into a sweater, and so I feel entirely mad for making something this intricate. 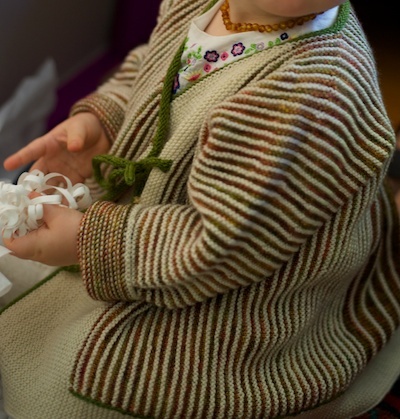 Myrie’s little sweater was Minni – knit out of Madeleine Tosh Sock in Antler (the cream) and Magnolia Leaf (not the cream). 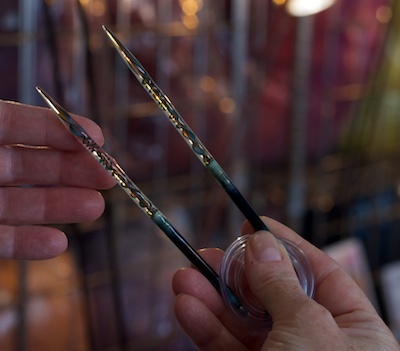 The needles – in case you were wondering, were 2.25mm and 1.75mm – fiddly, I know. I trimmed it in green left over from a sweater last year, and I made the largest size because when you make something like this, it should fit for a while. It had lovely details. The overall pattern was a ridge of garter, alternated with two rows of stockinette, but in important spots – like across the centre of the back, or at the top of the shoulder, that switched to garter, for extra stability. I crocheted a little chain of the green along the border at the bottom, because the pattern said to, and because it was very pretty indeed. 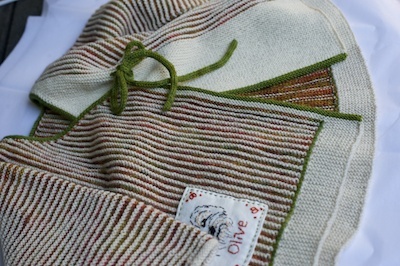 There was no end of fussiness, but the best part was the little embroidered patch. Since I finished early, I decided to give my idea a whirl. 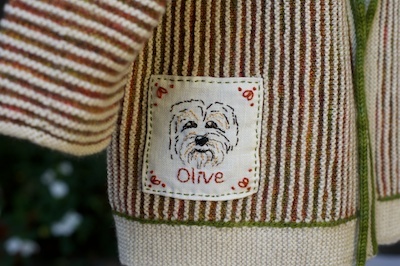 The pattern came with a few little templates for the embroidery, and they were cute, but Chris, Robyn and Myrie have a sweet little dog, Olive, and I thought it would be extra cute if she was on the patch. 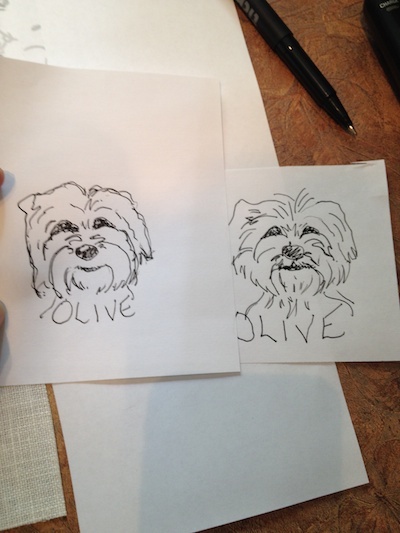 I had my mother-in-law send me pictures of Olive, and I did a little sketch. When we all agreed that the little patch looked just like Olive, I held the sketch up to the window, and put a little square of linen over it so I could see through. I transferred a few little markings to help me stay on track, and then I started embroidering the dog onto the patch. A few incredibly fiddly hours later, I had the patch done, and it was as cute as I had hoped. 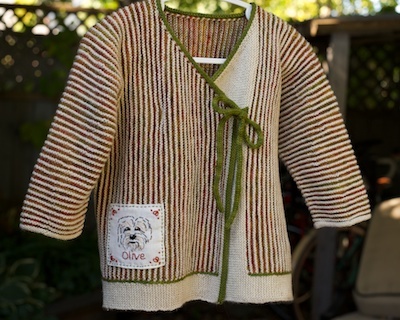 It personalized the sweater beautifully – it was nice work before, but a one-of-a-kind special thing after. 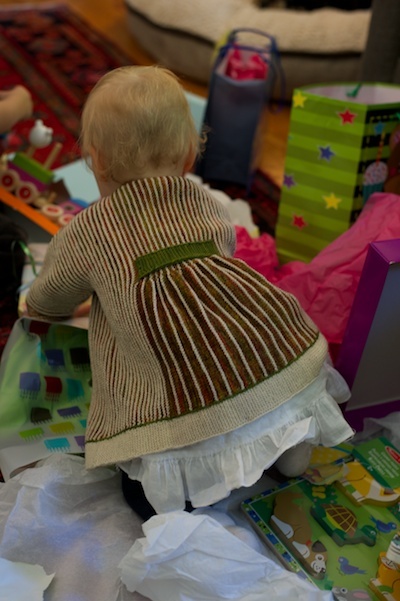 I think they loved it, and as silly as it seemed, the best part for me wasn’t the patch, it was the sweet little diaper flare over her wee bum as she crawled that really did it for me. I am totally and completely thrilled with this sweater. If a knitted thing has to stand in for you, then this, this is the sort of sweater that I’d like to have do it for me. So completely perfect in every way. Myrie wore it for hours and seemed to think it comfy – unlike the hat I gave her, which she ripped off and threw on the floor. (I’m not bothered by that. I hate hats too, and I bet she likes it better at -20. I’ll show you the hat tomorrow.) 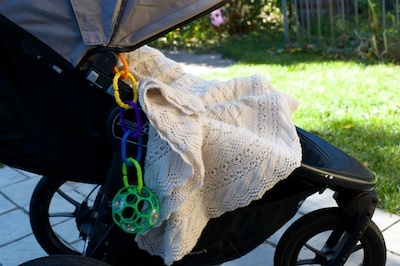 The little miss stayed awake long enough to be doted on by all of her adoring fans, then corked off for a wee nap in the garden, sleeping in her buggy in the cool fall air, wearing her sweater, and tucked under her blanket. It was lovely to see them being used, and I liked how it felt to me. Even if I’m not around – I’m around her. 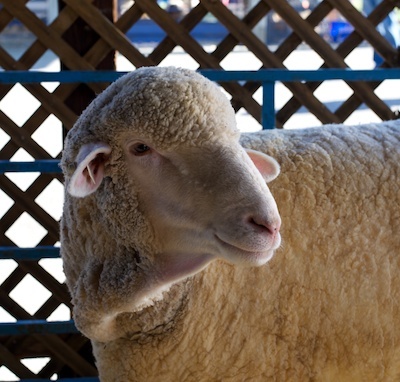 It’s just my wool instead of me. 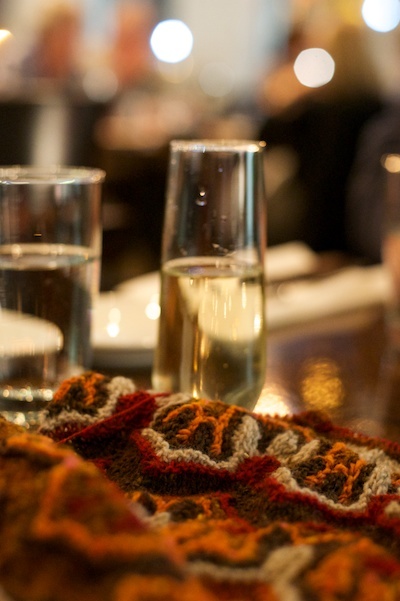 If you’re a knitter, it’s the next best thing. Yesterday I picked up the million stitches that I cast on provisionally so long ago, and as I went back and forth to my meeting on the streetcar yesterday, it was somehow finished. This morning, there was just the ends to weave in (about a thousand) and then I did the last little bit of finishing – a single chain of crochet along the border between the stripes and the plain bit. Crochet isn’t my best thing – even a chain is hard for me to make tidy, and not at all for the first time in this project, I wondered why I do this to myself? The deadline, the late nights, the fiddly bits? It’s hard to explain, isn’t it? How you’d torture yourself a little bit, all for the sake of a wee gift? Today, I’m finished (almost) in enough time to do the optional bit. The original sweater has a little embroidered patch on it, and from the beginning I’d thought that maybe I’d do it, and maybe not. I can embroider, but not quickly, and not too well, so I though that if there was time, I’d give it a go. I’ve got the stuff together, and if it works out, I’ll sew it on, and if it turns out to be a train wreck I’ll burn it under a full moon and pretend it never happened. I have a really cute idea for it though, if it works. There’s other big news though, way bigger and way better than me struggling through a sweater of unusual fiddliness, and it’s this. Just a day ago, that arrived at Kelly’s Canadian address. (Her daughter/my niece Savannah lives there.) 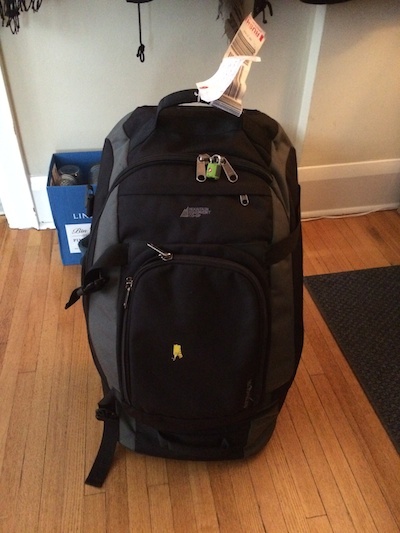 It is (DRUMROLL PLEASE) Kelly’s missing suitcase. That suitcase left Madagascar with Kelly on the 31st July, and promptly went missing. Kelly arrived, and it didn’t and within it was Kelly’s entire knitting for an entire year. (I’m just telling you this, in case you didn’t read the entry about it last week) Kelly has spent the last several months trying to track it down. Many calls, many claims, many frustrating episodes with the Air Canada reps, during which nobody seemed to really understand that this wasn’t simply a lost bag, but a lost years worth of work. As many of you said when I blogged about it, it was heartbreaking. 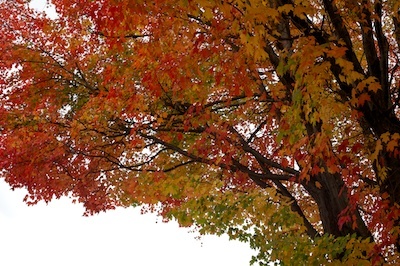 On October 2nd, I blogged about it. Kell and I had talked, and we weren’t sure if anything would come of it, but we imagined that it couldn’t hurt. 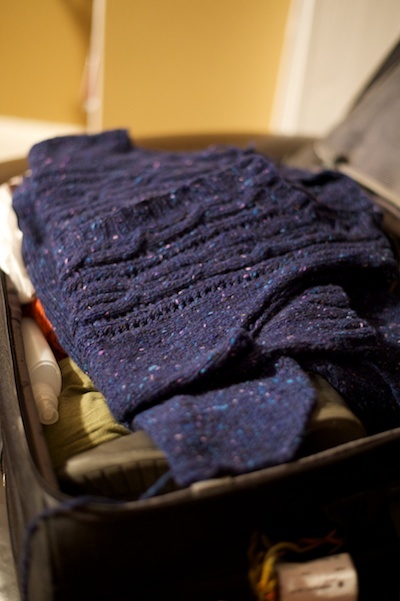 Maybe somewhere there was a knitter who worked for Air Canada, or the baggage company, or… we didn’t know. At the very least it seemed like this should be a grief that was shared. At the very least, Kelly would have the sympathies of people who understood to balance out the 47 heartbreaking conversations with customer service. It worked too – and not just because people started looking for the bag, but because Kelly read all of the comments that night, and she felt less alone, and less crazy, and she texted me that night and said “The comments made me cry. Some people really, really understand”. We do understand too. 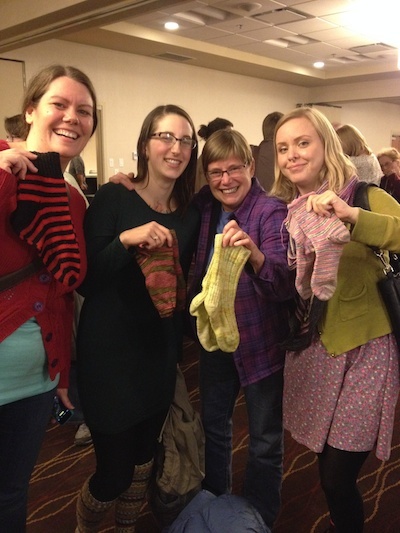 When Kelly wrote about the loss of the bag, she talked about what it’s like to knit for people you’re not with – people you can’t be with as much as you like. 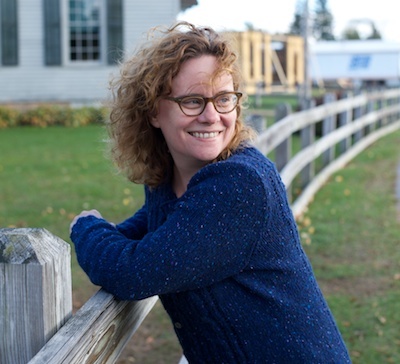 She talked about conjuring the feelings of Lou’s little arms round her neck when she knit sleeves on his sweater, or the feeling of Myrie’s soft skin which she made her a vest. The desire to keep them safe and warm and care for them, even though she can’t from where she is. 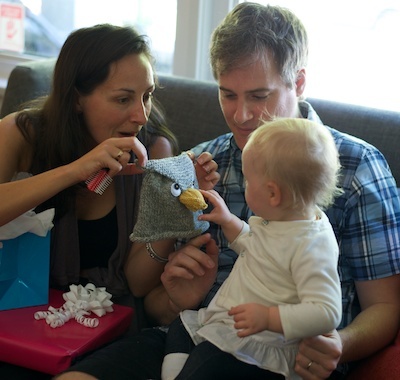 All of that, you know… it gets poured into little knitted things, and to lose those things? I think to Kelly it felt like losing that connection. Your gift to her went beyond that understanding though, although that would have been more than enough, I assure you. Many of you tweeted to Air Canada, and some of you did work in the right places, and some of you had insider email addresses to people who might be able to help, and you drew attention to the nature of the disaster, and Air Canada did tweet back and say that they were looking, and I guess maybe the power of so many knitters giving the problem so much attention paid off, because just a few days ago, after months of no movement, and the certainty that the bag was gone, right after I posted about it, a courier called Savannah and said the bag was found. In London. The bag arrived, and Savannah opened it up, and behold, all of the things were in there. 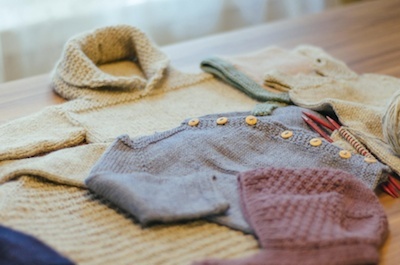 Warm vests, little dresses, tiny sweaters, and bigger ones too. 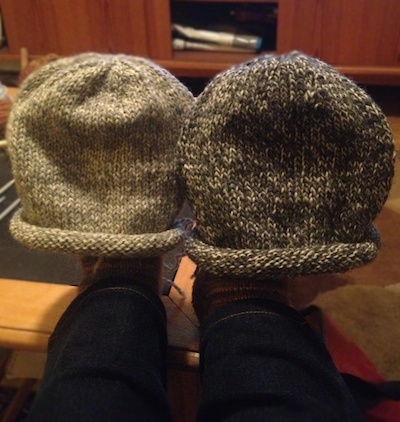 Hats to keep little ears warm… all the things that Kelly had looked crazy knitting in Madagascar…. They’ve all found their way home, on the brink of another Canadian winter. It’s like a little Kelly arrived. These things will be all her proxies. When Katie pulls a sweater over Lou’s head, it will be like Kelly’s there to give him a hug. When Myrie’s cozy in January, it’s Kelly who will have done it, and while she sits in the sweltering heat, far from all of it, she’ll know she’s doing her bit. She’ll be present, in a way. I would like to thank all of you for the solidarity, support, positive thoughts and activating your networks! We may never know how the bag found it’s way home but it cannot be a coincidence that only 4 days after this appeal – it was found in London! As you know, I live very far from all of the people who mean everything to me. 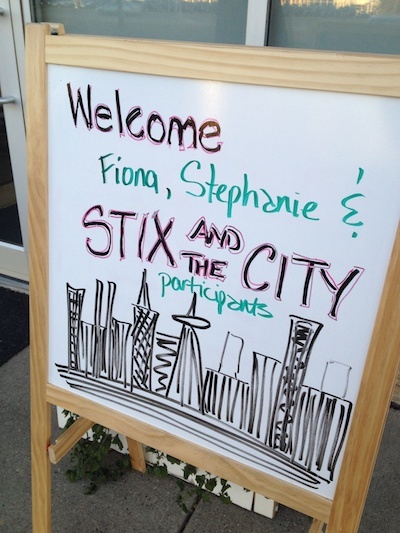 In my absence, a couple of very special people were born. 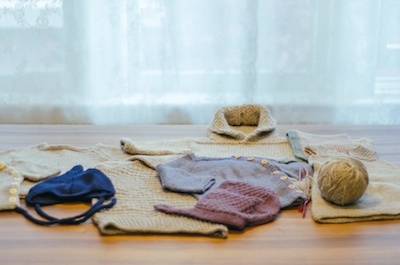 I knit for them almost every day and all of my love goes into these little hats, sweaters and dresses. 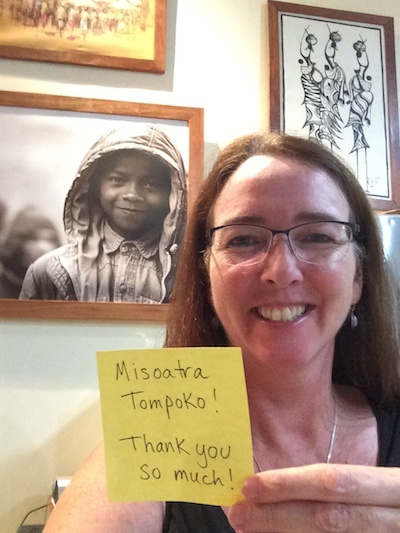 Misoatra Tompoko! (Thank you all so much). I can stay up late to make that happen. It’s magic. Five minutes later, my intellect had caught up with me. There are 120 rounds in the sleeve. If I do 30 each night for four nights, that’s it done. Tuesday, Wednesday, Thursday and Friday. Saturday I do the bands (except that’s two days work, but let’s gloss that over) and then bingo. Done for Sunday. Except for this… Sunday is Thanksgiving. We’re celebrating two days in a row, once for each family, but that means that Saturday can’t be a big knitting day, it will be a day for shopping and cooking and roasting pumpkin and that means it will be a small knitting day, and so that won’t work. I very intelligently thought that through, and upped the number of rounds to 40. 40 for each night, and then I’m done on Thursday, and I can do the bands Friday and Saturday, and I’m still done in time. I patted myself for being so clever, and stayed up late to do 10 more. I trundled off to bed, and lay there plotting out the next few days and realized two things. Thursday I have meetings that will take up some time – 40 rounds though, that should still be cake. I reminded myself to get wrapping paper, and then I remembered. Blocking. I’ll have to block the sweater, and weave in the ends, and it will need at least 24 hours to dry (damn you damp weather) and that means… I almost got up and did 10 more rounds. I didn’t, but today I’m going to have to pick up the pace. 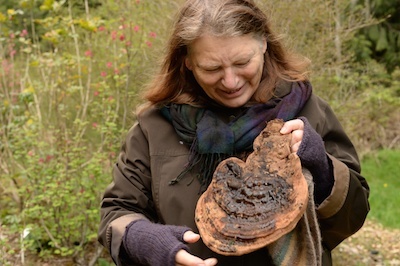 In other news, a few spots (and we do mean a few) have opened up for the retreat that Debbi and I are hosting at Port Ludlow in November, and we’d love to fill them. The classes are tiny and intimate, the nicest way to learn (only about 14 or 15 people per class) and our theme this time is “Emergency 911”. 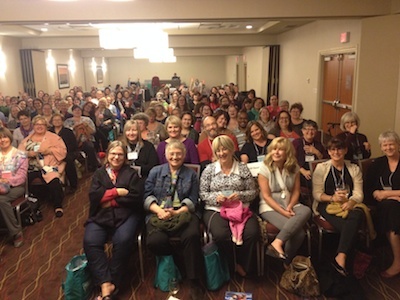 I’ll be teaching knitting rescue and repair. 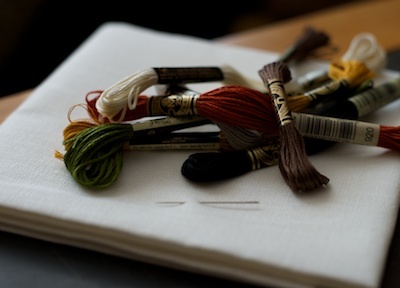 We’ll focus on mistakes and getting out of them, and on fixing damage to finished knitted stuff. You’re more than welcome to bring damaged goods, and we’ll have a go. 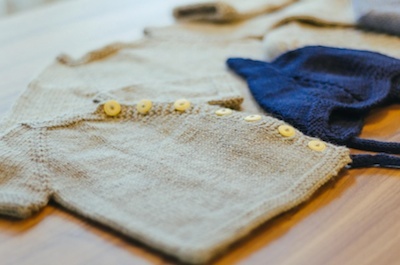 I’ll also be more than happy to take a look at your knitting style, and see if it could be streamlined, and made more efficient and quick. We’ll be joined by our good friend Judith MacKenzie, spinning teacher of considerable fame. She says this about her class. “Does your wheel seem a little under the weather? Cold chills, a bit sluggish? Bring it in for a tune-up and a little tweaking. All spinning implements welcome. I have a few magic remedies that might be just what you need for good wheel health. Does your long draw falter? 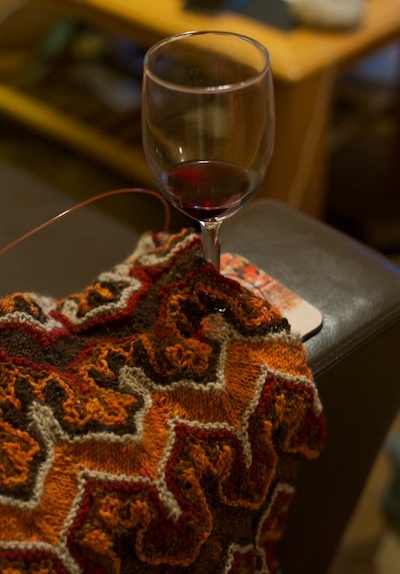 Is your worsted a little the worse for wear? We’ll diagnose the problems and put you back on the road to recovery. And do you have fiber that seems terminally unspinnable? Bring it along and we’ll see if it can be resuscitated! Sound good? Yes. I thought so too. (This is another one of those times that I wish I wasn’t teaching so I could take that class. 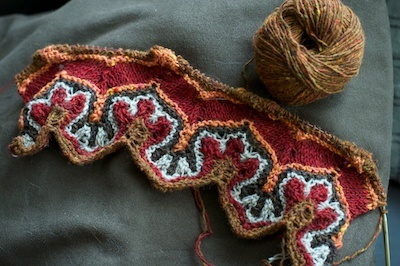 My worsted is definitely a little the worse for wear.) Also with us this time, a special treat, Carson Demers is coming. 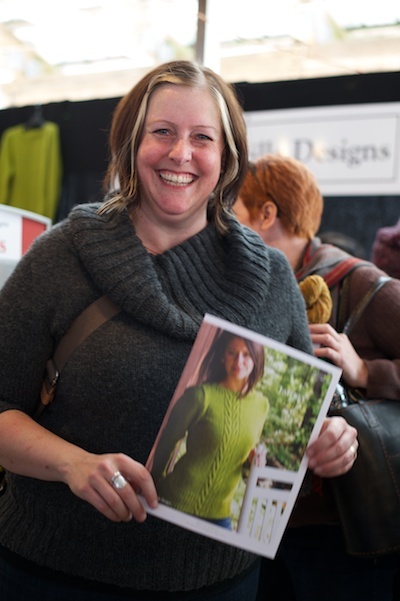 If you’re interested, send us an email at StrungAlong@yarnharlot.ca, and we’ll get right back to you. Like I said, we’ve really only got a few spots left, but we’re proud of these retreats, and we think you’d love it. 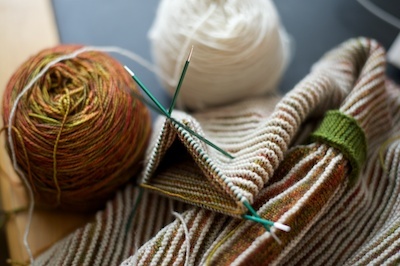 It’s a special thing, and a great opportunity to learn how to save your knitting, spinning, body and (depending on what you get away from when you take this break) your mind. PS: Apologies, and in response to a question or two, YES. 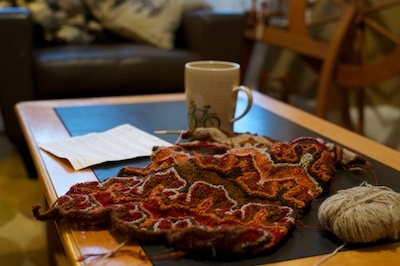 This retreat is perfectly good for beginning spinners and knitters. Only basic knitting skills are required (cast on, off, increase, decrease, knit and purl) and beginning spinners will do just fine. If you can spin a continuous thread (of any type) you’ll be just fine. Judith has a special way with new spinners, and getting to work with Carson while you’re new can keep you from growing bad habits.